The Winlok Marble Fireplace with Lights is a stylish and versatile piece that is produced to our highest quality specifications. Purchasing this fireplace from the largest and most reputable retailer in the UK ensures that it is custom built and will be delivered in a timely and safe manner. The result is peace of mind that allows you to thoroughly enjoy your new fireplace. The Winlok Marble Fireplace with Lights has many incredible benefits. As it is long and low, the Winlok can be used to mount an LCD television safely and comfortably without having to crane your neck to see it. 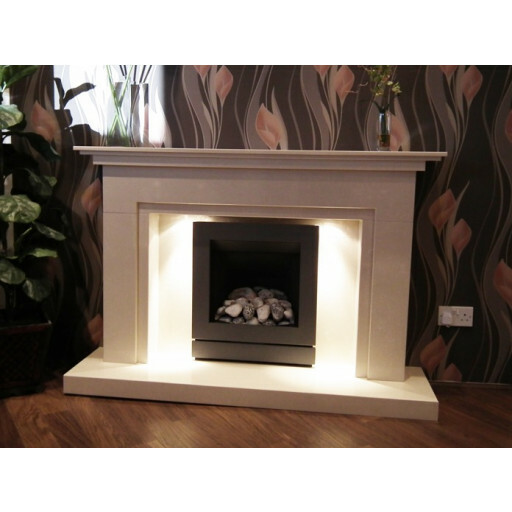 The fireplace features twin LED down lighter, making it a confirmed favourite of our happy customers. With its warm beige or cream colour, or the elegant white marble, this classy piece enhances the mood of any style room, whether modern, classic, or rustic. It is also available in a natural solid Portuguese limestone. Best of all, we strive to offer the best products for the best prices, meaning that you not only get a stunning addition to your home, but also a product that is competitively priced.